More than 1,000 people braved a snow storm to hear Hillary Clinton make her final pitch Monday night to New Hampshire voters before Tuesday's primary. 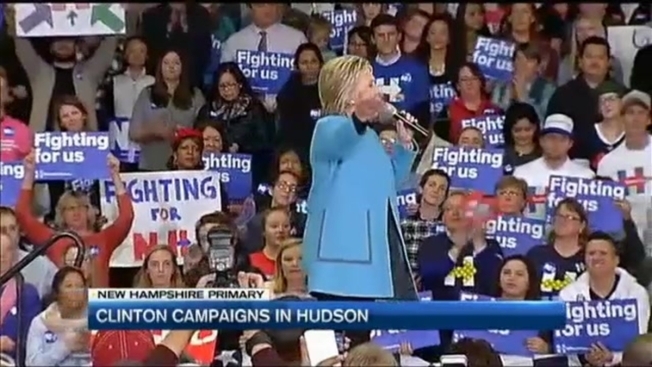 At a rally in Hudson, New Hampshire, Clinton described herself as a bridge-builder and change-maker who will fight to expand economic opportunity, while protecting national security and always listening to the concerns of Americans who have often been overlooked. "Imagine that we are actually putting people to work to fix and build the infrastructure that this country needs to be competitive in the twenty-first century economy," Clinton told the crowd. "Imagine that we're not only building and repairing roads, bridges, tunnels, ports, airports-- we're actually also repairing and building the pipes that carry water into the homes of children like those who live in Flint, Michigan." Dennis Frenette of Hudson said he wanted to hear Clinton to learn more about her priorities, and see in-person how she carries herself. Frenette said he often votes Republican, but has been discouraged at what he labels a negative tone he believes many Republican candidates have taken this primary season. "The biggest thing is that foreign policy type stuff," Frenette told necn, describing Clinton. "She really knows what she's talking about with that stuff." Supporters in attendance said no one has been tested the way Clinton has, dismissing nagging concerns over her use of a private email server for some official business as Secretary of State. "I think it's politics," voter Dori Higgins, a teacher in Hudson, said of the email server controversy. "I think everybody, if you dig far enough, you'll find something." "I don't really care about her emails," added voter Gail Koutroubas, who attended the primary eve rally. "All I care about is policy, and that she does a good job, and that she brings the country forward, and she does great things for America." Several people in attendance whom necn spoke to expressed great admiration for Senator Bernie Sanders of Vermont, Clinton's rival in Tuesday's primary, who is showing leads in many polls across the Granite State. However, those same Clinton backers who said they respect Sanders for the economic inequality and campaign finance reform issues he has advanced in his campaign added they believe Clinton is better positioned to win a general election against any eventual Republican nominee. The Clinton supporters said she has the experience required to serve as President of the United States on day one. "I think Bernie is a wonderful candidate, and in different circumstances, I would probably be willing to back him, but I'm also thinking about electability," explained Paul Coppens, a New Hampshire voter who was one of the first people in line for Monday's rally. "I'm looking at Trump, Rubio, or Cruz, and I think Hillary has good electability factors against any of those three." Clinton said she will continue to campaign and encourage get-out-the-vote efforts through Tuesday's New Hampshire primary.